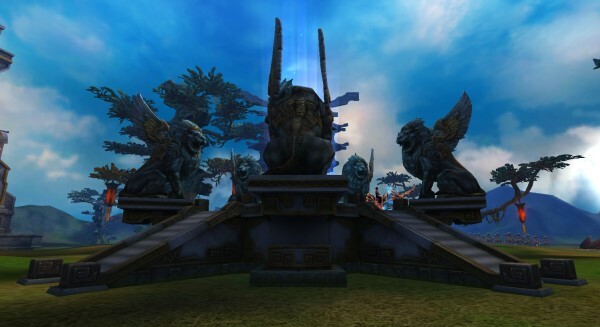 Perfect World International is a 3D fantasy MMORPG that offers players a vast adventure through a world torn by war and chaos. With one of the largest customization systems of a F2P MMO, PWI truly makes each character unique to the player. The graphics stun the players as they explore the vast world and show how a beautiful world can be shattered into chaos in an instant. With over 4 different worlds completely explorable to any level of player, PWI offers an adventure that will last for many years! PWI is also known as one of the longest reigning Free to Play MMO’s out there, which speaks for itself. As a player of PWI for over seven years, I can tell you that once you get past the first few tedious and repetitive tasks of the game, it can easily become very enjoyable and addicting. I’ve hit cap on 3 characters and then reawakened them all to do it again, because many functions of the game keep its players interesting and immersed in the vast worlds of Perfect World. I’m constantly drawn back every year to see the new changes and how they affect the gameplay. I played a cleric for 4 years and can’t get enough of the excitement of being a healer! As a long time player, here are my thoughts about the game. In this Perfect World International Review I try to be as professional as possible and present both the positive and negative aspects of PWI. In a game world like Perfect World, it’s extremely easy to become lost to the vast regions of almost empty space all over. The players can travel to any corner of the first world at as low as level 5 once they complete the tutorial zone and learn the basics of the game. PWI keeps players interested by adding a massive expansion every year, which in turn attracts the players who’ve left to return as well as many new players who notice the new expansion. The game world is large, and it will literally take a player 2 hours to travel from one corner to another on foot. This is why they have flying and teleports! With the ability to fly, every class can take to the skies and fight up high or just enjoy the bird’s eye view of the breathtaking world around them. After level 80, the players can travel back in time to the Old Heaven’s Tear map and enjoy yet more unique enemies and quest lines bound to keep the player interested. After 90 the players can traverse to the Morai world, which arrived with the Earthguard Expansion. And finally at level 100, the players can journey to the newest edition of the Perfect World and reawaken to the Untamed World. Perfect World International’s developer is the famous Perfect World Entertainment, one of the most successful free to play MMO companies in the world. They also developed Forsaken World and the new hit MMO Neverwinter Online. From my personal experience, this is one of the BEST games for character customization. I’ve witnessed thousands of unique characters that never have a single look-alike in the game world. There are several sliders for each part of the character’s body, from its head to its foot size and all. There are also hundreds of hair styles to choose from, also with options of highlighted, straight, or wavy for every option. There are 5 races with 10 classes in total that cover all the bases for any play style a player can think of. The players can become an Untamed, Human, Winged Elf, Earthguard, or Tideborn and specialize in either of the race specific classes. For the Untamed the options are Venomancer, a beast controlling class, or a Barbarian, the best tanking class. The Humans can be Blademasters or Wizards. The Winged Elves can be Archers or Clerics. The Earthguard can be Mystics, a combination of Veno and Cleric, or Seekers, a combination of Blademaster and Archer. The Tideborn covers the faster gameplay with the Assassin and Psychic classes. Aside from the initial customization each player gains stat points every level that they can place into any of the 4 main stats, as any class. Strength will decide how hard a melee class will hit (excluding Assassins); Dexterity determines how often the player will hit with melee abilities as well as crit rate and ranged damage (and Assassin damage); Magic determines how much mana a player will have as well as magic damage and defense; and finally Vitality determines how much physical defense and HP the player will have. There is also a wide variety of fashion to choose from as well as mounts and flyers to soar the skies with. All of which add a personal feel to how unique your character will be! Here’s where things can become dull and repetitive at time. You level up by completing quests and fighting the monsters of the Perfect World. Most quests will send you to the same monster, so it’s always a good idea to go and pick up all available quests you can find if you think you’ll need them to level with. You can gain many of the levels from just fighting the monsters over and over just as easily. The mechanics of the game have changed quite a bit since the early Vanilla days, and with such levelling has become a lot easier. A player can now accept rewards just for being logged into the game for certain amounts of time, often containing large amounts of experience points with boost the players levels a long way when first starting out, making the early quests obsolete and pointless to follow unless the player is looking to follow the lore of the game which is a dark history of betrayal and invasion. On top of the constant XP gains from being logged in, the player also receives a similar reward every 5 levels they gain. These rewards give XP as well as massive amounts of potions and other items that the player will use as they level up. They also contain upgrading items for gear improvement as well as temporary mounts and even more items that help out. The combat basically follows a simplified button mashing style. You can place skills on the skillbar from slots 1-12 (11 and 12 being – and = for buttons). There are too many skills to fit them all on the skillbar, so it’s best to create macro commands for the skills that are most useful (not recommended for healing as it reacts too slowly to keep up on heals). The game’s current level cap is still 105 from their Vanilla release. However, once the players reach level 100 they can choose to be reborn and start all over with more stat points to further customize their build and access new lands. The newest update has brought with it “rebirth” and the new lands only reborn characters can access complete with new dungeons and raids. 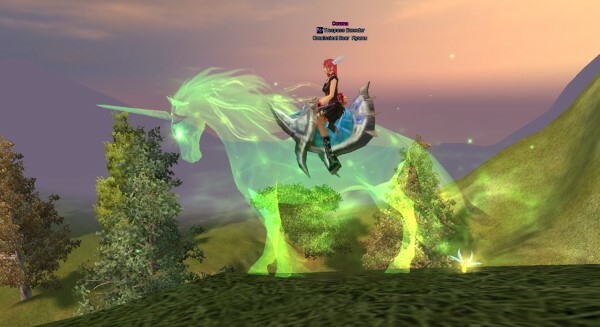 PWI offers many means of transportation from mounts on the ground to flyers in the sky or even other players! Female players can “embrace” the male characters and be carried by them to any location, just don’t go diving into water as it will break the embrace. There are several mounts that any and all races can use, and multiple ways to acquire these mounts. The easiest way is to buy it with cash, but there are also achievement mounts as well as quest mounts for certain quests, as well as duration mounts which can be gained over a certain amount of days being logged in. Flyers are as they state, they allow the player to fly up to 80 meters above the game world, which is quite high in this game as most of its land is around 5-10 meters above the water. The flyers are race specific and all players get a free one at level 30 from a quest, as well as a time limited one earlier from one of the level achievements. In Perfect World International, crafting is considered one of the most useful skills to have. I say this because all of the end game equips are crafted, not a single one can be gained any other way. You have to do many dungeons to get all the parts, but nonetheless, you craft it after. Tailoring and Blacksmithing are the two most used crafting skills of PWI. This is the only way to make the end game armor and weapons from level 70 on. Both skills add their own touch by giving the players a chance to gain gem sockets to allow for further improvements, usually 1-2 socket chances, but they can be improved with items so it can have up to 4 sockets for gems. Apothecary is the other large crafting role, since it’s the only way to get high powered potions that prove most helpful when the cleric just isn’t enough to keep the group alive (which happens often in end game dungeons). There are other crafting skills for trinkets and jewelry that also helps, but they are not as necessary due to the trinkets being drops from the instances as well. PVP in PWI is a big thing for many end game players. This is a hobby for almost everyone at some point or another. Territory Wars offer a large scale 80 Vs 80 battle between two factions at once. In a TW the factions must build towers to protect their crystal while attempting to destroy the enemy faction’s crystal. Nation Wars are server wide battles that take place on a puzzle like map, divided into 4 nations of Light, Water, Fire, and Dark. The Nation Wars allows any player above level 40 to participate, however only the high levelled players will truly benefit from the massive 2 hour long constant battle. The players are rewarded based on contributions to the overall battle and how well their nation did. There is also an open world PVP system, however, the players must be flagged for PVP in order for them to be attacked (on PVE servers that is). Arenas also provide a minor team vs. team experience for those who want PVP without flagging when Nation Wars aren’t available. The game can be very rewarding in the end game. Once you hit 100, you can reawaken and restart at level 1 with twice the power, making all the old game content even easier, and the new content a challenge beyond compare. Venomancers can evolve their pets at 100 as well. Multiple PvP instances (Territory Wars, Nation Wars, Arena’s), as well as several dungeons that can be explored alone or in a group. Many helpful players, despite the several unhelpful players who intend to torment other players. There is a lot of enjoyable content in the end game and middle levels past level 70. Several ways to level up, leaving each player to do their own thing and build their skills how they feel necessary. Although the world is large, it makes you feel like it’s much smaller due to many of the quests forcing you to go back to the same area. The GUI is also outdated so it lacks a user friendly interface. Several ways to level make it so easy a caveman could level to 100 in about a week. World bosses are spawn killed by overpowered players. It’s difficult to start making in game coin in the game due to the DQ mats being degraded to 1 coin when sold. Several bugs still exist from the Vanilla state of the game. It often takes a while to find groups for group content. The world is inhabited by many bots. Aside from everything the player can encounter in the game of PWI, there is still much room for the player to grow to enjoy the game. Upon hitting level 100 the option for rebirth opens up and gives the player a brand new world to explore and quest in, all of it very well worth it. The Morai world is also very great to explore upon reaching level 90. The game itself has been stable and running for over 7 years so the player base is extremely large, and Archosaur shows how many shops have been made by the players. PWI proves to be addicting and one of the longest reigning F2P MMO’s there is to date. The gameplay is quite immersive and can keep anyone occupied for several years regardless of their chosen play style. I wanna play The Secret World!